Hi there! We are back with more fantastic inspiration this evening. Start by making a drippy background using Distress Stains in Blueprint Sketch and Stormy Sky onto watercolour paper. Mixed crackle paste with DecoArt’s American Acrylic Paint in Neutral Grey, and use a palette knife alongside the ‘Grungy Union Jack’ stencil and once fully air dry, paint with DecoArt’s Antiquing Cream in Carbon Black. Once dry, wipe away the excess using a damp cloth as this removes the excess paint and just leaves the coloured crackles. Adding silver gilding wax gives a wonderful metallic finish. I wasn’t overly careful wiping away the antiquing cream as I like the extra smudgy effect it gave. Stamp the headphones from the Music On World Off set and these along with ‘Mr Bone Jangles’ onto acetate using Stazon ink. Carefully cut these out and attach to the card over a slither of muslin. 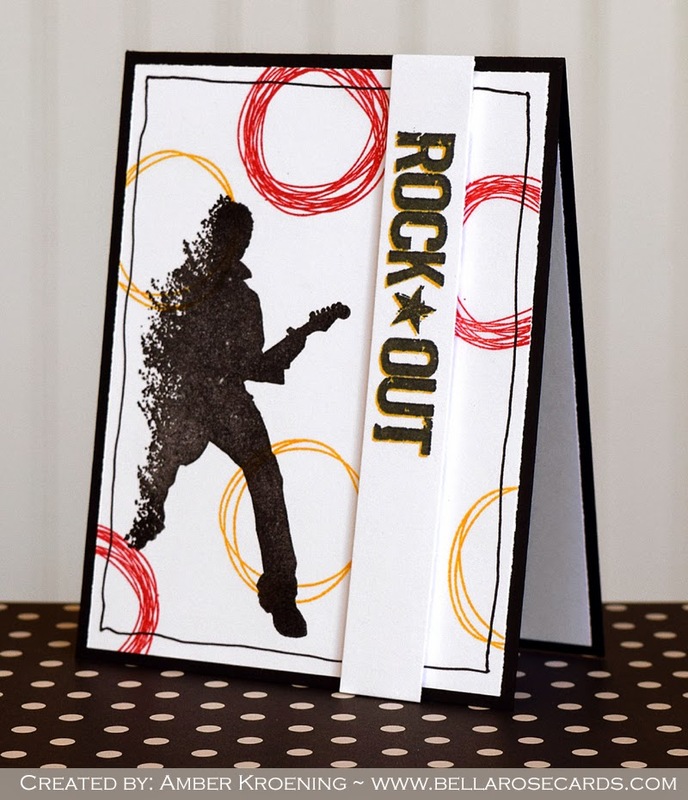 To add to the music theme, add musical notes and the lightening flashes from the ‘Music On World Off’ set using embossing powders in Black and Metallic Platinum. To finish, add the sentiment and add the ‘Parental Advisory…’ image from the same set as the musical notes. 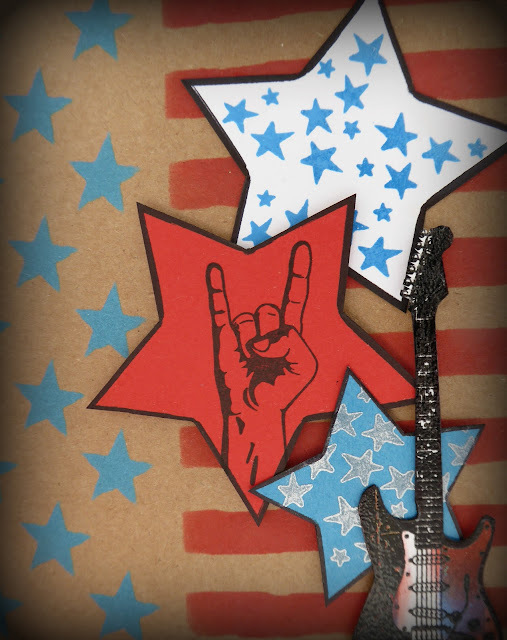 You could of course adapt the card to use the Stars and Stripe stencil which would look equally awesome… and in fact I’ve already had a go at this and will share soon! Thank you for reading and enjoy the rest of your weekend. Hello! Hope you are having a good weekend. Have you seen our quirky NEW family definition stamps? We think they’re really cool, and rather useful, so we’re really excited to be launching them on Create and Craft TV next weekend! I simply positioned the stencil over my card and used blending sponges and a selection of four Distress Oxides through the stripes. 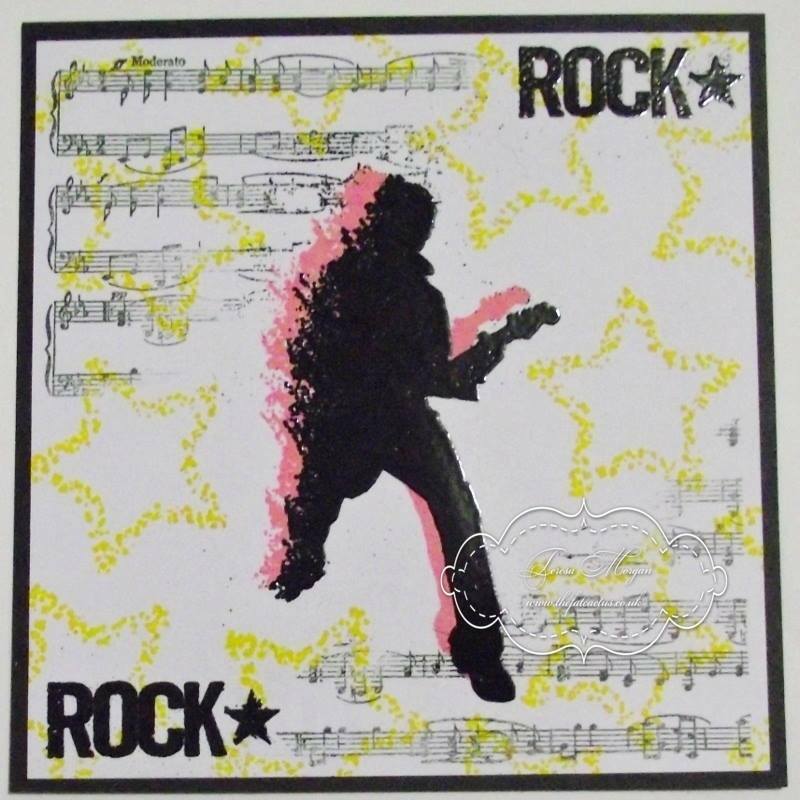 I also stamped separately four stars which come on the ‘Rock Out’ stamp set, cut them out and stuck them round the awesome definition of the word SON..
which was stamped with white embossing powder onto white card. I then used my blending sponge and blue Distress Oxide ink to colour the card behind. All mounted on a simple A6 tent fold card, this card was complete within minutes, and I love the simple effect achieved through using just one section of these new amazing stencils. And I know that Visible Image fans are going to love these too! September’s Visible Image challenge theme is…. Distressed! Be sure to add your make to the album over in the Facebook group to be in with a chance of winning a fabulous £40 coupon to spend in the Visible Image Shop! 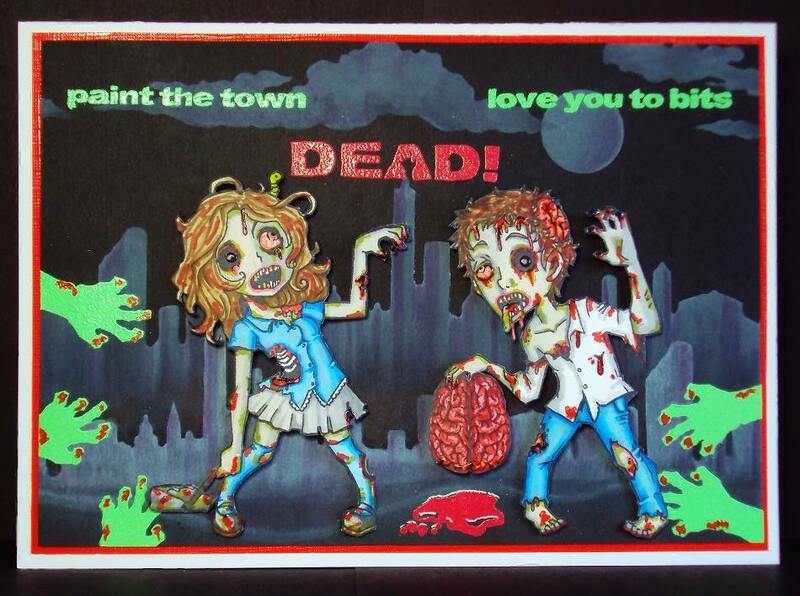 We absolutely love this card! Thanks Nicky! And how awesome that it’s so quick to make too! 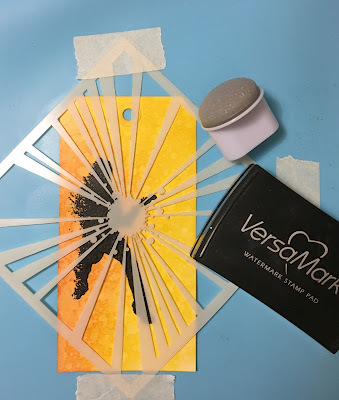 We will be back later today with a stunning mixed media tag from Veerle Moreels, and tomorrow we have a brilliant card from Jane Tyrrell, using the exact same stamp and stencil as Nicky… but with a totally different look! Thanks so much for stopping by today, enjoy the rest of your Sunday. Our final post for today comes from Pauline Butcher who, as always, is injecting some colour into Friday!!! I hope you are all well, just a quickie today, a card I made for one of my recent workshops, I do love passing on techniques. The unique stamps I’ve used, are designed and made by hand, by Mark and Helen at Visible Image, they both work very hard, and are very passionate about their company and their fabulous stamps. 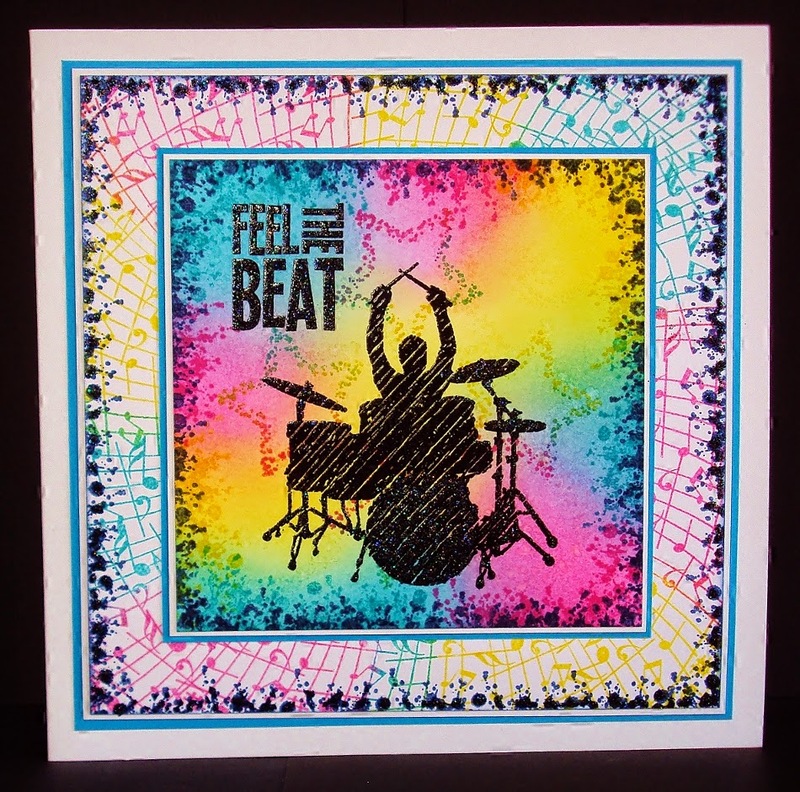 I used Brusho’s for the background, along with spray starch and cling film, such a cool vibrant outcome!I stamped the sentiment with Versamark, mixing 2 colours of sparkle Embossing powder, before heating to set. The Image is made using Angelina Fibres, placed on top of the stamp which has Versamark on, then ironed, such a fab technique, and finally fussy cut. If you are going to the NEC next week, do pop along to the Visible Image Stand, B09 where you meet Helen and Mark, see some of the stunning stamps available, also see loads of inspirational DT work, and you will also see me, I am doing ‘Make & Takes’, but get in early to book your place as they are limited. It’s the last few days to get your Pink entry into the Visible Image ‘Show and Tell’, for a chance to win some fabulous stamps, check it out HERE. Also pop over the the Visible Image Facebook Group, and see the inspiration the fans of the stamps are producing, HERE. Thanks for checking my post out. It’s like this technique was made for this stamp! 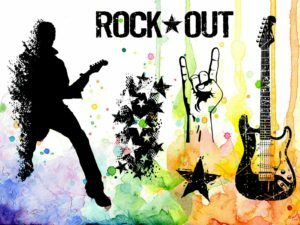 If you LOVE music or make cards for someone who does, then head over and check out the whole collection HERE! Good Morning 🙂 The sun is shining here in Wales today… hoping we have summer back for a while! Welcome back for my Thrilling Thursday inspiration post for Visible Image stamps. I love these little alien invaders…..so much that I had to have a group of them on my card this week. 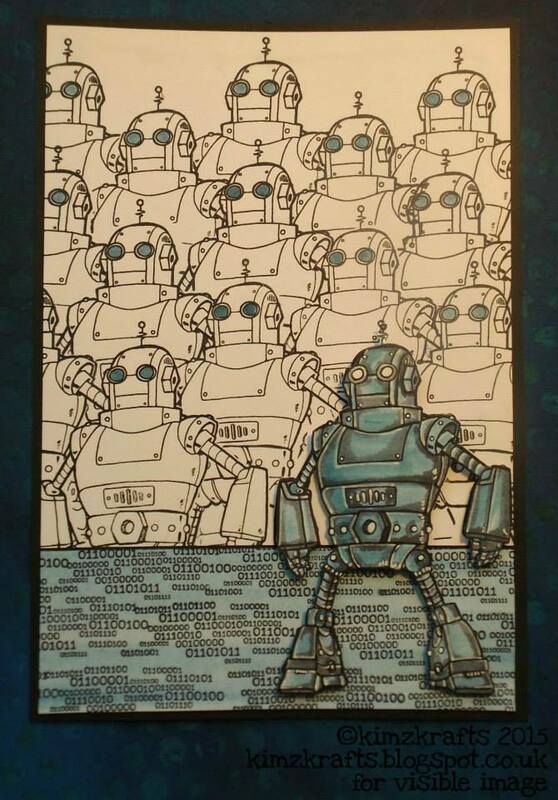 I used a masking technique to stamp the little guys overlapping each other and coloured them with Promarkers. The background is blended Pan Pastels and I doodled a little border around the edge. 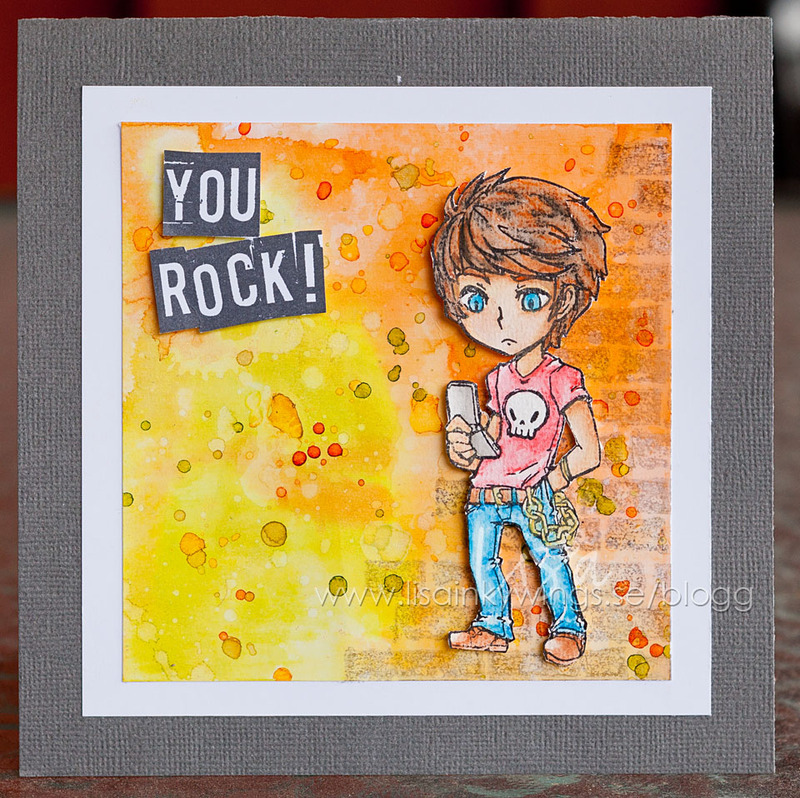 I cut out the speech bubble, stamped the sentiment and added another little freehand border. What a fantastic card… any younger boy or sci fi fan would just love it!!! 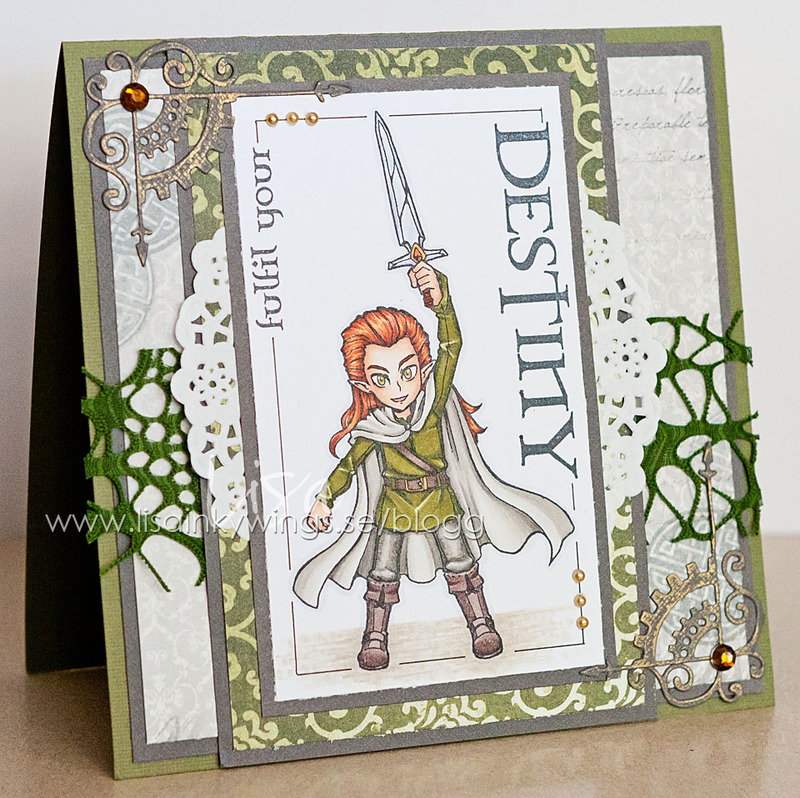 You will find more of Teresa’s awesome work over on her blog. Have a great day, hope the sun is shining where you are too! Good Evening! Another gorgeous day of sunshine here and another busy busy day of stamp making! Time for another brand new image from Visible Image! I’ve used the cool Robot Data Set on a CAS card. The screen and the words are two stamps, so you can variate this in lots of different ways. Just look how cool this Robot is with all the details! 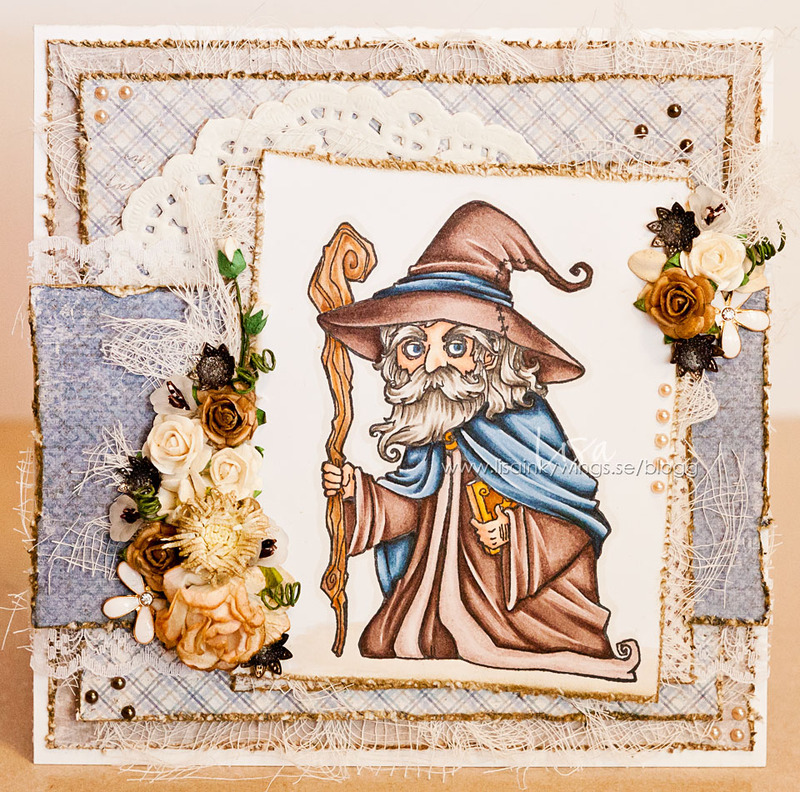 Kim Robertson will be here a little later with more NEW stamps inspiration, so we hope you’ll pop back later. 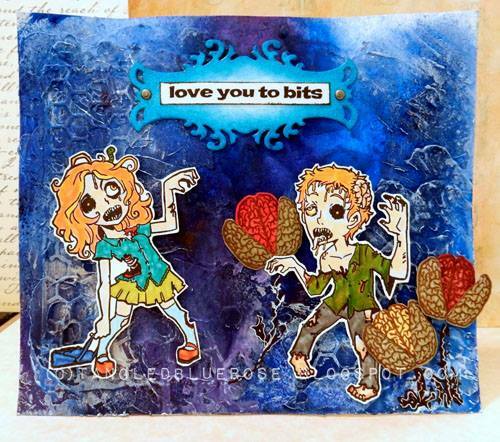 I’m doing my Visible Image Stamps blog early this week, as I have swapped with my teamie Sue. This is a card I created at the beginning of the month, using some fantastic Visible Image Stamps, for my Wonderful partner Rob’s Birthday. 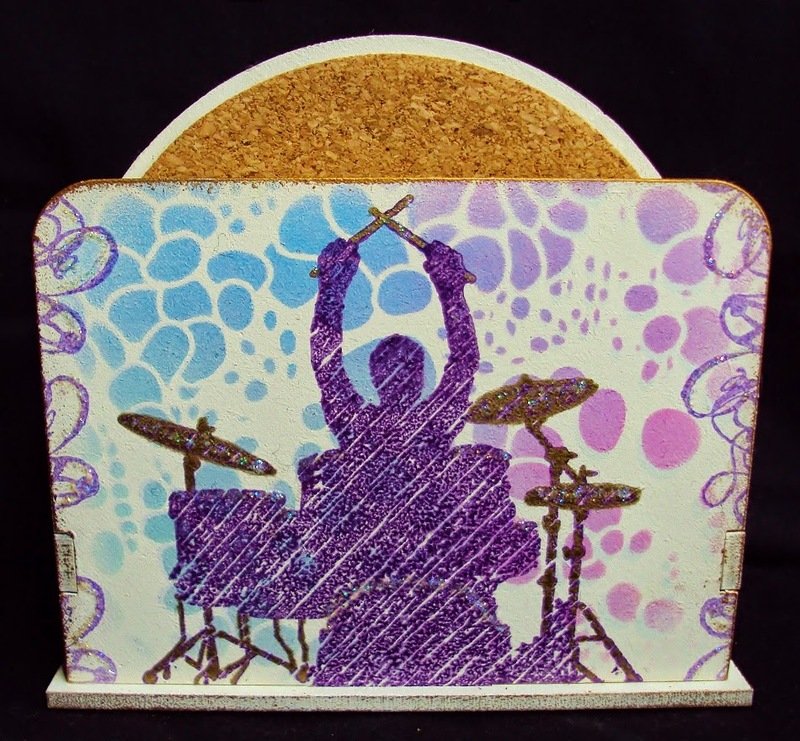 He is a drummer, so these new music themed stamps are genius for him. 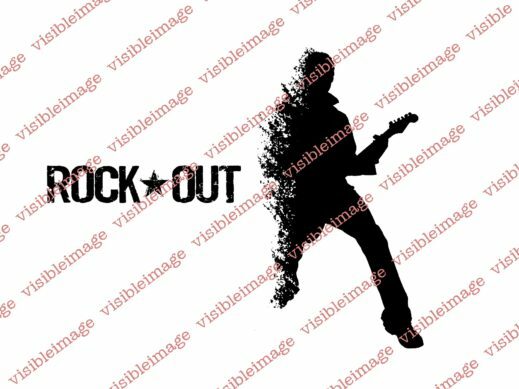 The Visible Image stamps I used were……. 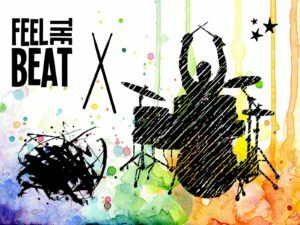 Feel The Beat, Universal Set, Soul Music and Angels are Near. I started off with a 5 1/4″ x 5 1/4″ piece of Centura Pearl card, (I always use the mat side of the card for blending Distress Inks, it’s nice and smooth). I blended Mustard Seed, Picked Raspberry and Peacock Feathers onto it, making sure that there was Mustard Seed in the middle. I then used the star stamp from the Universal set and stamped 4 stars using the same colours tone on tone. I Stamped the drummer and the sentiment using Versamark, and heat embossed with black powder. Using the feather stamp from ‘Angels are near’, I stamped just the inky tip around the edges using the same colours, tone on tone again, and then another layer at the edge using Chipped Sapphire. This would have made a great 6″x 6″ card, but I decided to go bigger, lol. So, on the mat side of a piece of Centura Pearl 7 1/4″ x 7 1/4″, and using the music stamp, I stamped from the middle out all the way around the card, again using the same 3 colours to co-ordinate with the topper. I then stamped the tip of the feather, again using Chipped Sapphire, around the edges. 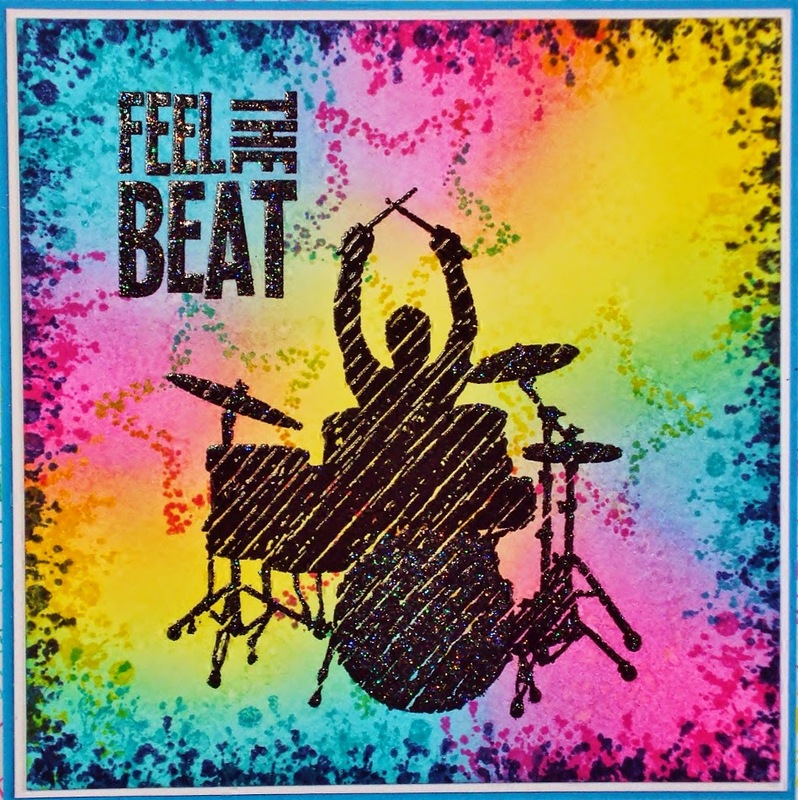 To finish off, I added Black Stickles to the sentiment, parts of the Drummer, and the edges of the larger background, I then mat and layered onto an 8″ x 8″ card blank. Don’t forget to enter the Visible Image ‘Show and Tell’ competition, for a chance to win some fantastic stamps, details HERE. 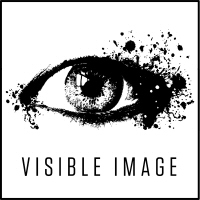 Also visit the Visible Image Facebook Group HERE, there’s always lots going on, and plenty of inspiration too. There is a Visible Image Workshop day, in Bristol, on Sunday 17th May..
10am – 4pm, organised by the ‘Out of the Blue – Gift Shop’. I shall be conducting 2 workshops, using some very unique Visible Image stamps, at the Compass Inn, Tormarton, included in the day is a yummy Roast Dinner, for more details or to book phone 01454 312355. Such an amazing card! 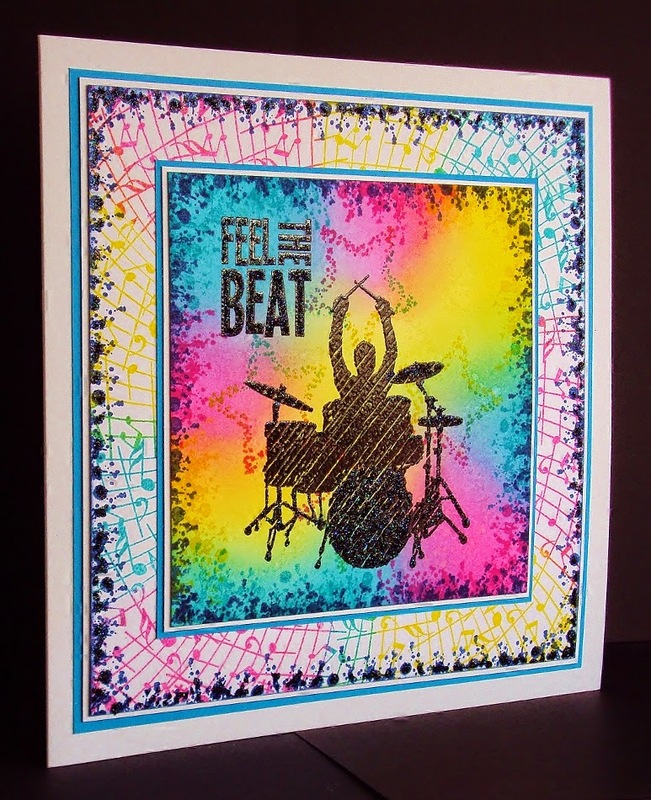 Love how Pauline has stamped the Music wave around the edges and cool use of the feather too! Striking colours and doesn’t the ‘Universal Set’ make an awesome background! If you are in or around the Bristol area, Pauline’s workshops are superb – it will be a fantastic day on May 17th. 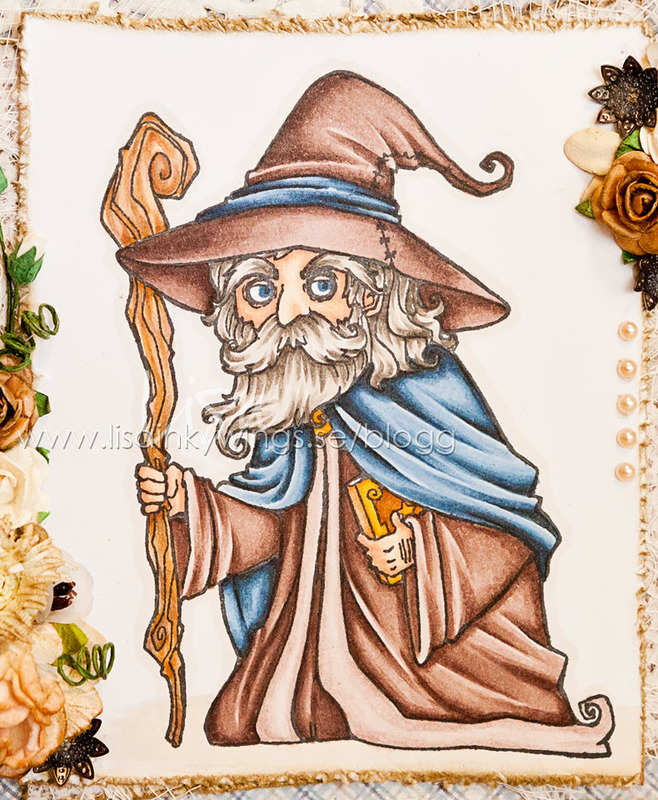 You can find more of Pauline’s awesome work over on her blog. We will be back again later with ‘Wonderful Wednesday’ inspiration from Kim Robertson and Lisa Nygards. Then we will be all caught up and normal daily inspiration will resume tomorrow with Teresa! Hello 🙂 Happy Saturday to you! Hope you have a great weekend planned. Don’t forget to join in on our April Show and Tell challenge! 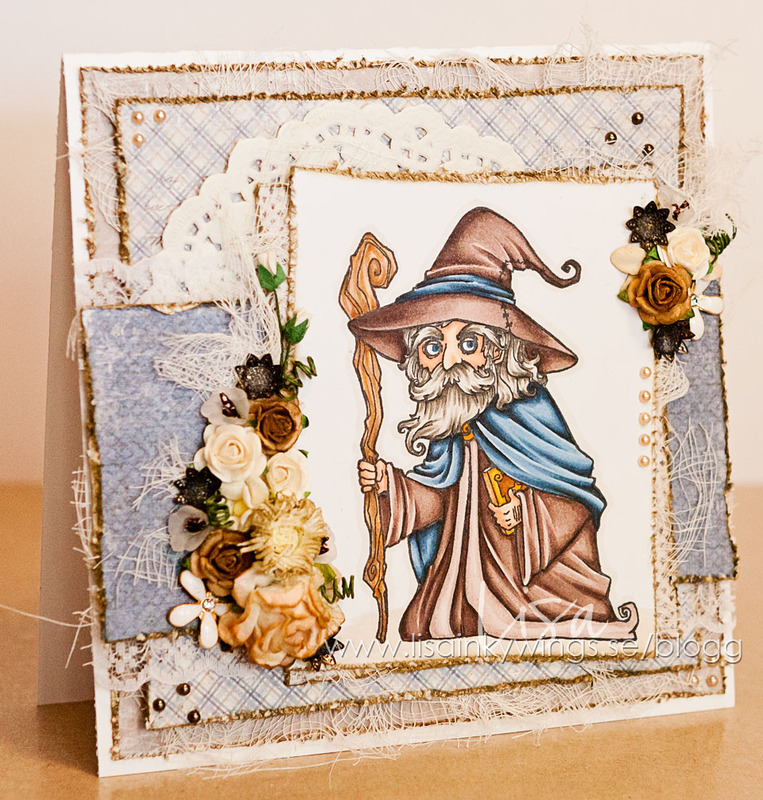 And to see more of Amber’s amazing cards, check out her blog. Have a brilliant weekend, and go easy on the chocolate!!! Hello There! 🙂 We are back with some awesome inspiration for you today! It’s Thursday once again and that means it’s my turn to wow you with some more Visible Image inspiration! 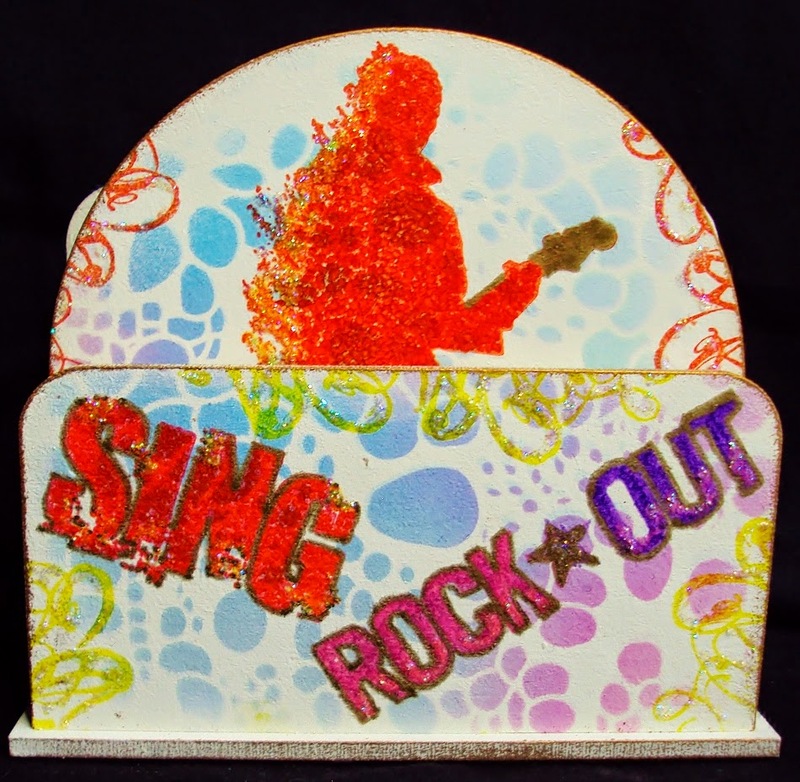 This week I have used the amazing Rock Out set of stamps (with a couple of others) to create some loud and funky cards. 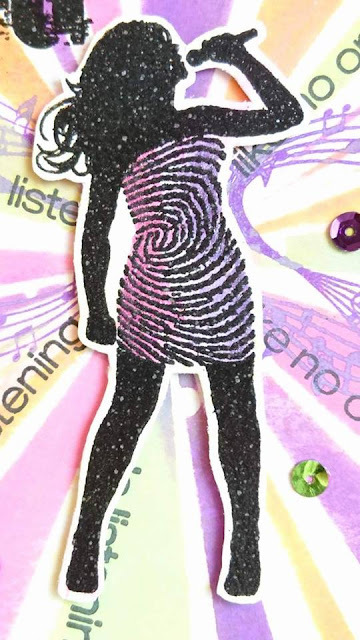 I created the first card by stamping the image with different colour Distress Inks, offsetting it to create the shadow effect (paying homage to the golden days of TOTP). The final image is embossed with black embossing powder. I offset the sentiment in the same way, and inked around the edge of the card to add extra interest. My second card has the Music Score stamped in the background as well as the funky star from the Universal set. I only partially inked the music stamp as I wanted it to fade out towards the centre. I also only inked up half the sentiment. I love the fact that you can choose which parts of the stamp you want to use, it gives such versatility. 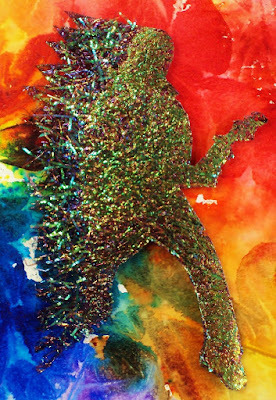 The guitarist and sentiment are both embossed with black embossing powder. My final card has a Ska feel to it….some of us can probably remember Two-Tone Records!! 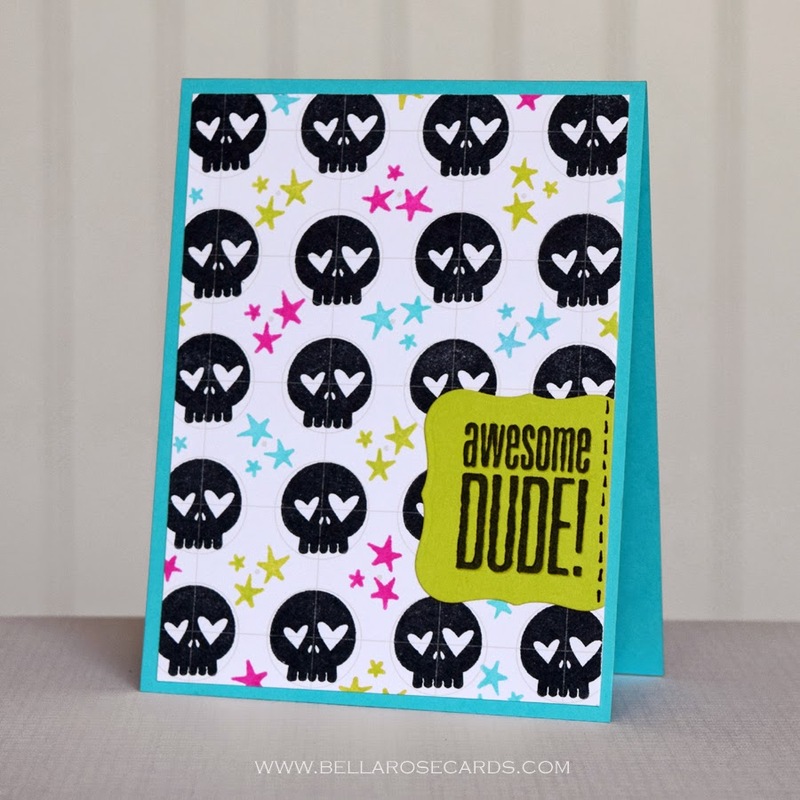 I used the Grunge Check background and white embossing powder on black card. 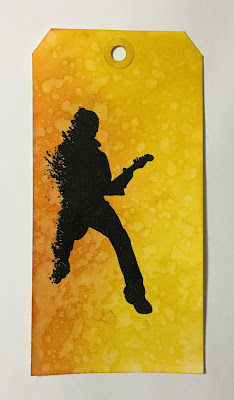 I then used black embossing powder on the guitarist on some white card. The sentiment is stamped on each piece so that it lined up and embossed in opposite colours. Simple, yet strikingly effective! 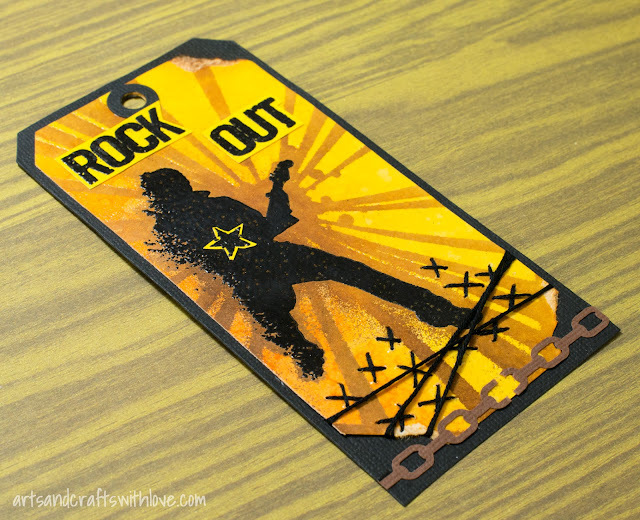 I hope that you are inspired by my projects today – I think that the Rock Out stamp set is a must-have for all those teenagers and men in our lives!! Visible Image Facebook Group – Daily DT inspiration, monthly Show and Tell contest, hang out with other Visible Image fans and share your work. Have a great day and we will be back tomorrow with our fabulous Friday post from Pauline Butcher.